"Roses" are for the beloveds. New Year brings hopes, desires and take resolutions which are common during this holiday. Its a celebration continuing with the christmas. Roses gifted for the beloved makes the lover's emotions linger through out the day and some days to come. A bouquet of Roses means a lot. They are a lovers ultimate possession for recieving and gifting. Each Rose has a different meaning. They can be gifted according to the recievers favouritism. The number of Roses gifted also has a different meaning. Different flowers like Tulips, Lilies, Carnations, can be gifted to all. Flowers speak volumes and volumes... Flowers became a symbol of sensual gift for any person in Love. Flowers are gifted and recieved with a whole heart. They are never returned, as they soothe a person even though not in a pleasant mood. Florists say that gifting flowers has increased in the past five years. This increase in the consumption of flowers became a full time job for many families in the largest flower cultivating areas like Equador, and South America. On New Year day flowers are gifted as bouquets which are more popular than chocolates. They may range from similar flower bouquets to mixed flower bouquet arrangements. A Flower Basket is also a good choice as it can last longer than a bouquet. Flower Topiaries have also become a fashion. Even if there is an absence of one's sweetheart, he or she can be felt by his/her gifted flowers. Such is the power of the flowers presence which fills the heart with Love in ones life. It is said that Rose is the King and Lily is the queen. Go ahead in gifting flowers like Roses, Lilies, Iris, Orchids, Dendrobiums bouquets to your dear ones. New Year is celebrated on Jan 1 st of every English Calender. 1 st January is seen as the first day of the whole 365 days. New Year brings hopes, desires and people taking resolutions is a common feature among the people in USA. New Year is greeted to welcome the year. The celebration of New Year begins the night before, when Americans gather to wish each other a happy and prosperous coming year. This is marked by giving favourite gifts, like bouquets, chocolates, here in USA. 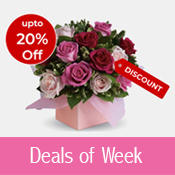 Now-a-days, sending bouquets as gifts has become a common feature keeping the time constraints among the people. Different types of bouquets can be sent keeping in view of the favourite flowers of the recepient. 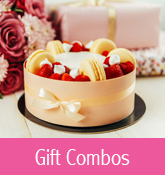 The common bouquet of flowers sent on this day may be like A bouquet of Roses, A bouquet of Stargazer Lily, Assorted Tulips, A bouquet of Dozen Roses, A bouquet of Iris flowers, A bouquet of White Dendrobium Orchids. A Gardenia Bonsai and Topiary can also be gifted on the New Year day. New Year! Here comes the New Year which is less than a week ahead. The New Year comes with new hopes and dreams. The New Year itself brings in the freshness of flowers and fills the heart with sweet aroma making it remain the whole year. The flowers gifted to anyone on this day unfurls different emotions of the giver to the recipient. The flowers say what words cannot say. As it is said, Pen is mightier than the sword, it cannot be denied that flowers are the stronger in emitting emotions than the whole lot of words. The New Year morning is something special than every morning. Love is the language of flowers. They can be gifted to any one. Flowers gifted on that day remain with the recepient heart for a long time to come. New Year Flowers can be virtual and artificial too. Artificial flowers may take the place as substitute of virtual flowers, but they cannot entirely replace the real flowers. Such is the charm of the virtual flowers. Let us this year send some virtual flowers of our beloved favourites and make them the freshness of the favourite flowers linger in their hearts for the the days to come. Presenting yet another Lily wonder - Starry Nights! It's a carnation-lily extravaganza that can also do for a mother's day apart from being, of course, a Christmas gift. But the star-gazers lend a feel that doesn't make the gift an obvious choice for mother's day. Christmas is just 5 days away, anyway, then you can well say it with Starry Nights! But yes, the pink makes it a typical gift for any manifestation of love. Star-gazers make you gaze at their beauty. They are the beauty queens of the flower kingdom. This Star-Struck bouquet is accentuated with red roses that add more beauty to the bouquet. Roses mean mushy romance while the star-gazers add style to the same attitude ! Presenting Star-Struck ! You have finally found an online flower shop that delivers to as many as 80 countries! This is just your place to be if you have your dear ones spread across the world. It is easy & secure to order with us and you can send a floral gift across the globe to the ones you care or want to convey greetings. We bring you a floral splendor with varied designs of floral arrangements right from a pretty looking daisy bouquet to a extravagant Birds of Paradise arrangement! Our arrangements cater to local culture and tastes of the recipient country. Yes, the Flower Expert Shop started off and we are encouraged by your response. Many of you have shown great interest in our Christmas flowers collection. Our brilliant-looking Christmas Centerpiece that adds on a cheer to your Christmas dinner table has been doing very well. The Holiday Delights that brings in the Christmas flourish home has mustered good fans among you and yes, you have also taken a liking to our fun-looking flower vase Christmas Delight Arrangement. While some you have really taken to the wreaths that reflect the festive bounty of Christmas. If you have any great shopping experiences with us get going and share them with us. You must be really having fun shopping so it will really interesting to hear all the things you have to tell us. We are all ears! And yes, hope to see you at the shop again! Roses are the Universal symbol of Love. Red Roses do signify love. This vibrant bouquet of Dozen Red Roses makes the receiver overwhelm with joy. These Red Roses Captivate and Entice your sweetheart. This Dozen Red Roses are suitable as Anniversary Flowers, can be given as Birthday Flowers, specially as Christmas Flowers. These flowers are shipped fresh which would be ready to bloom. Red roses are the symbols of love and dozen red roses are a traditional gift for valentines. This Dozen Red Roses in Vase as cutflowers is specially designed by the professional designer with the best quality red roses carefully selected by the florist with green to enhance the appeal of the arrangement. They are placed in a long transparent glass Vase. You can send this Dozen Red Roses in Vase to internationally to anywhere in the world. You can order online, these flower arrangement for this Christmas. Roses are Universally loved and adorned. Red roses signify love. Do you know that casablanca lily symbolises Love at first sight? Yes it does. Red Roses fill the heart at the first sight. This flower arrangement is suitable as gifts for Anniversaries and for Christmas. Sending this arrangement makes a person's heart fill with Love. This lovely Red Roses and Casablanca Lily Arrangement is specially designed with the idea of making this arrangement the ideal gift for your valentine. You can send this Red Roses and Casablanca Lily Arrangement with greenery to any place of the world internationally. The best, skilled florists of the world would make this arrangement and deliver it at the place of your valentine internationally around the world. You can order online, this flower arrangement to your valentine for this Christmas. Introducing The Flower Expert Shop: We might just have what you want! Thank you! You have been with us and liked our work! Thanks to you, The Flower Expert has been the best flower encyclopedia online. Your flower-questions and gardening-queries have forever challenged our flower experts. Yes, you are our treasured floral fraternity. It's a pleasure to serve you and we continue to do so. Knowing your pulse, we thought it's just the time to cater to your floral-shopping tastes that's just what we have done. Yes, we just launched an online flower-shop! Let the party begin! Presenting The Flower Expert Shop! Take a look at what we got to offer and tell us what you think of it. Visit The Flower Expert Shop Now!! When we think of Christmas, the idea of live Christmas wreaths, Christams flowers - Poinsettias, bouquets, flower baskets, table centrepieces etc., come to our mind. Ancient Romans used them as a sign of victory. The green color represents the Church's color of hope and new life. Christmas Foliage Basket is an ideal gift for the Christmas. Its greenery makes a person pleasant on the big event that has been planned well. Christmas Foliage Basket is made of 3 carnations, 2 chrysanthemums, 1 button pom, seasonal foliage, berries, gold pine cones, sleigh. All these items sit pretty in a basket. Mark Zboch is a cultivator and dealer of original and authentic shade, flowering, ornamental and fruit trees and shrubs. His online nursery, Fast Growing Trees has helped many people enjoy the pleasure and advantages that come along with growing a tree. When we think of Christmas, the idea of live Christmas wreaths come to mind. Wreaths symbolize life and hope. Ancient Romans used them as a sign of victory. The round shape of the wreath represents eternity and green represents the Church's color of hope and new life. This stunning green wreath has been made by hand. The double colored red ribbon is made into a bunch and tied at a place and the lace been left hanging to give a beautiful look. This green beautiful wreath can be gifted to your beloved. This christmas Wreath can be hanged on the walls or doors which gives a traditional look to the doors. Poinsettias are the symbols of Christmas. They are so beautiful to look at. They give a green and red look which are the symbols of Christmas. They are made into a beautiful bunch with a long and wide basket. 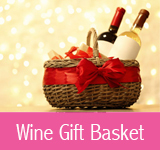 This green and red basket can be gifted to your beloved or place it on the table during christmas. I believe that many people truly intend to simplify their holidays each year, but because they wait until the last minute to take action, they inevitably fall into the same old habits. Because there is so much to do and so little time to do it all, these holiday-harried people end up going into "autopilot" and doing everything in the same old familiar way. Christmas shop before the Christmas rush. Of all the things you can do to make Christmas easier for yourself, this is probably the biggest. Dont wait until the stores are crowded with thousands of holiday shoppers. Ask family members for their Christmas wish lists and get busy now. Complete Christmas crafts. If your plan for Christmas gifting includes giving handmade gifts, plan to have them finished by Thanksgiving. Work at it in the evenings and each weekend until you are done. Take care of time-consuming tasks. Writing Christmas cards, wrapping gifts, boxing up presents to mail why wait until December to attend to these time-consuming details? Knock them out now. Fill your freezer. Each time you cook, double, or even quadruple the recipe and freeze the extra portions. During the hectic weeks before Christmas, having heat-and-eat meals in the freezer will be a lifesaver. Plan volunteer activities now. Does your intention of doing some kind of community service always get lost in the holiday shuffle each year? Use the months prior to the holidays to investigate various opportunities for service and decide which ones you want to include in your Christmas season. Plan holiday meals. Write out menus and shopping lists for dinners and get-togethers so you wonÃÂ¢Ã¢?Â¬Ã¢?Â¢t have to think about it later. Use this time to experiment with any new recipes you plan to use. If you usually cook the entire holiday meal yourself, simplifying for you this year may mean asking for help. Decide what components of the meal youÃÂ¢Ã¢?Â¬Ã¢?Â¢d like to delegate and begin recruiting helpers. Decide what to delete. Which obligations add to your stress level each year? What activities would you rather forgo? Decide in advance how to diplomatically decline these engagements. If your life constantly runs at high speed, you may feel overwhelmed when you read this list of ways to proactively simplify Christmas. Maybe you barely have time to complete the things you have to do each day, much less perform tasks for a holiday months away. If you are in that predicament, let me encourage you to take things one step at a time. Many of the tasks above can be done while you're doing something you would normally do anyway. Your family has to eat every day, right? While cooking those meals, why not double your recipes while you're at it? It really doesnt take that much extra effort. Do you usually spend time in front of the TV each evening? If so, why not wrap gifts, address Christmas cards or work on crafts while watch your favorite shows? And dont forget to include a little Christmas shopping as you run your normal errands each week. Proactive simplification is manageable when you do a little at a time and combine Christmas preparations with tasks you must do anyway. When laymen speak of the "flowers" of Christmas poinsettias, what they're actually referring to are petal-like leaves known as "bracts." Christmas poinsettias do have flowers, but these green and yellow flowers are small -- and certainly not the feature for which one buys Christmas poinsettias! The tradition of using wreaths as Christmas decorations dates to 16th century Germany, where Lutherans created the Advent wreath. As with most Christmas decorations, the wreath was a symbol of Jesus' birth and God's grace. There are types of wreaths which are decorated against a wall or hanged on doors. They are Advent wreaths, Living Wreaths etc. Advent wreaths: While Advent wreaths can still be found, they're less popular in today's more secular world. Living Wreaths: These Living Evergreen wreaths rank among the most popular styles. The christmas Wreaths are made by evergreens, most notably pine boughs, which are the basis of many Christmas wreaths. For a fragrant wreath, make one with rosemary boughs. Add a simple red ribbon and you have the perfect beautiful red-green wreath. Read More..
Last modified on Dec 31, 2007 | TFE v1.2 | © 2005-2017 Gifting Inc.